Well, I managed to finish up the "Part 3" quicker than I had anticipated (as I alluded to in my previous post). There are a LOT of folks in this list, so I'll give you time to digest these (along with those in parts 1 and 2) and I will post my selection for All-Time Triber Uniform Number Nine by the end of the weekend. Enjoy the read! Luke Easter - 6 seasons (1949-54) - Easter came from the Homestead Gray's swinging a killer bat and never looked back. He had knee surgery, but was still hitting so well, the Tribe decided it was time to bring him up. Many people consider 1950 to be his 'rookie' season because it was his first full season. No matter how you cut it, in 1950, he knocked the longest home run ever hit in Cleveland Municipal Stadium (477 feet). He also managed to hit 27 others in addition to that one during that season (1 shy of teammate Larry Doby). Easter is considered the 2nd greatest first-baseman in baseball history by some. You may or may not agree, but here are some numbers that definitely make a strong case: 472 hits on 1,725 at-bats with 256 runs, 54 doubles, 12 triples, and 93 home runs during his career, bringing in 340 RBIs. He struck out 293 times and was hit by 28 pitches. Getting hit may not amount to much, usually, but in 1950, he led the league in "hit by pitches" (10). Offensively, he racked up a .274 career average. And defensively? How about a .986 fielding percentage while serving as 1st baseman, and a 1.000 average as a right-fielder!? That's what I call sssssssmokin'! Matt Williams - 1 season (1997) - Well, if you're going to play for the Tribe for just one season, then joining the team for a World Series appearance ain't a bad way to do it. He played in 151 games as an Indian and got 157 hits. He scored 86 runs, made 32 doubles, 2 triples, and 32 home runs, driving in 105 RBIs. He left the Tribe for Arizona, batting .263. Mickey Rocco - 4 seasons (1943-46) - Rocco wore #9 for two seasons then switched to #10 for two seasons. While wearing #9, he made 1,058 trips to the plate which netted him 271 hits with 130 runs, 43 doubles, 11 triples, 18 home runs with 116 RBIs, giving him a two-season average of .253. He also managed to keep an overall .994 fielding percentage! Minnie Minoso - 4 seasons (1949, 1951, 1958-59) - We first met Minnie wearing #6, and we will see him again wearing #18. But, in 58-59, he sported #9. In '59, he was selected as an AL all-star. Interestingly, his two seasons at #9 were nearly identical - so much so, in fact, that he ended each of the seasons with a .302 average! Check this out (I'll list 58 stats/59 stats) - Games: 149/148, At-Bats: 556/570, Runs: 94/92, Hits: 168/172, Doubles: 25/32, Triples: 2/0, Home Runs: 24/21, RBIs: 80/92. Otto Denning - 2 seasons (1942-43) - According to baseball-almanac.com, "Lou Boudreau asked, 'Otto (Denning), have you ever seen Niagara Falls?' Denning replied, 'No.' Boudreau responded with, 'Good, we just traded you to Buffalo.'" I guess that was Boudreau's way of saying that Otto's 2-year .222 average just wasn't cutting it. In his Major League career, Denning batted in 129 games with 343 at-bats. He scored 23 runs on 76 hits, 20 doubles and one home run (32 RBIs). Then, he was sent to Buffalo. Ralph Kiner - 1 season (1955) - The Hall-of-Famer played his final Major League season with the Tribe (forced out by a back injury). His .986 fielding average complemented his .243 batting average (his career low). He averaged nearly 3 at-bats per game with a total 78 hits, 13 doubles, and 18 home runs which earned him 56 runs and 54 RBIs. Rico Carty - 4 seasons (1974-77) - Carty came to the Tribe from the A's and batted .363 his first season in an Indians uniform. Yes, that's .363 (91 at-bats, 33 hits). The next year, his average 'fell off' to .308 but he brought it up to .310 the next year. In 1977, his average dropped once again (to .280) and he was traded for Dennis BeBarr (please refer to earlier comment regarding knack for trading star players). Ron Hassey - 6+ seasons (1978-part of 1984) - Hassey was always one of my favorites. He played during the time I was really into collecting Tribe cards as a kid. 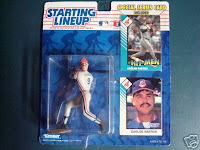 Throughout his Indians career, he switched between playing catcher and first baseman. He played in 25 games his rookie year and ended the season with a .203 average. That turned out to be his lowest career average. While with the Indians, his post-rookie year average ranged from .232 to .318. He is the only player in MLB history to have caught two perfect games (one of which was one of Len Barker's in 1981). Hassey's Tribe stats include 1,690 at-bats with 168 runs on 458 hits, 80 doubles, 5 triples, and 26 homers. He drove in 226 RBIs while being walked 196 times. He ended his time with the Indians batting .259 overall. In 2006, Hassey joined former teammate Mike Hargrove (they played together from '79-'84) to help coach the Mariners. Rudy Regalado - 3 seasons (1954-56) - He wore Number 8 for the first two years of his career, then was given Number 9 in his last ML season. He played first base and third base, but only played in 16 games during that final season. He had 47 at-bats, scoring 4 runs on 11 hits with 1 double and RBIs. He ended his career in the Bigs with a .234 batting average his final season. Torey Lovullo - Part of 1 season (1998) - Honestly, I had never heard of the guy before this countdown. Then, I understood why. He played in 6, count 'em SIX, games as a Cleveland Indian. How I managed to find a picture of him on eBay is a wonder! Well, in his six games as a Triber, he got 4 hits on 19 at-bats with a run, a double, and RBI and a walk. He struck out twice. He came to the Indians from the A's, batting .220 and he left Cleveland for Philly batting .211... Had you heard of him? There should be a good chance, since he played in the Majors for 11 seasons... I just never had heard of him, which is sad since he is currently the manager of the Buffalo Bisons... LOL, shows how much I do not follow minor league play, huh? 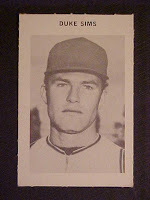 Ty Cline - 3 seasons (1960-62) - Cline wore #26 his rookie year, then played out the remainder of his Indians career wearing #9. He served as outfielder all three years, though he did not play the position full-time until his last season in Cleveland. His rookie year harvested a .308 batting average, which took a freeze in his 2nd year, as he dropped to a .209. He brought the average up to .248 before being traded to the Braves. In all, as a Triber, Cline made 444 trips to the plate, scoring 64 runs on 110 hits, 18 doubles, 7 triples, 2 home runs, and knocking in 31 RBIs. He was walked 34 times and struck out 55. Unfortunately, in his last season as a Triber, he was hit by the ball FIVE times! Someone was gunning for him... He was sent to the Braves after batting an Indians-career .255 average. Well, I finally catalogued all the latest cards I've received through trades and eBay etc, and it turns out I needed quite a few! Awesome! Some of the cards filled sets I've been trying/meaning to fill and others filled sets that I didn't realize I hadn't completed! Go figure. Still, I had a nice selection of cards that started new team sets. As of today, my non-duplicated Indians collection numbers roughly 7,017 (that number does not include items that are not in the database...YET!). Jim Hegan - 14 seasons (1941-42, 1946-57) - We've seen him wearing #4 and we'll see him wearing #10. He wore jersey number 9 during his first year in the majors (with the Tribe) and his last season in the majors (with the Cubs). In his rookie year, he had 47 plate appearances with 4 runs on 15 hits. He had 2 doubles, a homer, and 5 RBIs, netting him a rookie-year .315 average. Jody Gerut - 2+ seasons (2003-part of 2005) - Gerut made his debut on April 26, 2003, and came out swinging for the Tribe! In his rookie year, he had 66 runs on 134 hits (out of 480 at-bats). He hit 33 doubles, 2 triples, and 22 homers, racking up 75 RBIs and a .279 average. His next season didn't quite live up to his rookie year, but still he walked away with a .252 average after getting 121 hits on 481 at-bats with 72 runs, 31 doubles, 5 triples, and 11 homers. Unfortunately, he also managed to tear his ACL near the end of the season. Still, he came out in 2005 and played 44 games in a Tribe uniform, getting 38 hits on 138 at-bats, netting him a .275 average before being sent to the Cubs. Ken Keltner - 12 seasons (1937-49) - We've seen Keltner wearing #6 and #8, and we'll see him again when we get to #25. It turns out that he wore #9 in 1946 (in which he made yet ANOTHER all-star appearance). In his #9-wearing season, he stood at the plate 398 times (the 2nd fewest in his Indians career), hitting 96 times. Those 96 hits scored 47 tuns, 17 doubles, a triple, and 13 home runs for a .241 season average. Larry Johnson - 2 games (1 in 1972, 1 in 1974) - He wore #9 during his second "season" with the Tribe. He batted in one game in which he managed to score a run without hitting the ball or walking... Perhaps he was a pinch runner or something? In any case, his .000 average sent him to Canada (Montreal). We'll see him again much later wearing #52. Larry Raines - 2 seasons (1957-58) - Raines wore #9 during his rookie year, then switched to #16. In his rookie season, he batted 244 times, getting 64 hits. His 2 home runs, 14 doubles, and 16 RBIs combined with his hits to score 39 runs, giving him a rookie-year .262 average. Turns out, that is also his career high, as we will see later. Lee Stevens - Part of 1 season (2002) - Stevens came to the Tribe from Montreal, where he had batted a paltry .190. Would a change of venue help him bring his average up? Technically, yes. 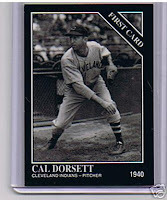 He batted in 53 games wearing #9 for the Tribe, making 153 trips to the plate in what would become his final MLB season. He got 34 hits, scoring 22 runs, 7 doubles, a triple, and 5 home runs with 26 RBIs. He left the Indians and the Bigs with a .222 final season. When this one snapped, it actually created a half-moon crack on the back, making it easier to get to the prize inside! The aftermath of freedom... Kiner and Garcia have escaped and all that remains are shards! In the mail today, I had an envelope from Spiff over at rangerscards.blogspot.com. These were totally unexpected! The cards he sent include: 2006 Fleer Ultra Cliff Lee, 1996 Fleer Ultra Julio Franco, 1982 O-Pee-Chee Joe Charboneau, 1996 Topps Carlos Baerga, 1998 Fleer Ultra Bruce Aven, 1996 Topps Kenny Lofton, 1995 Fleer Ultra Sandy Alomar Jr, 2005 Topps UH Futures Ryan Garko, 1992 Fleer Ultra Brook Jacoby, 1996 Fleer Ultra Julian Talvarez, 1994 Fleer Ultra Charles Nagy, 1982 O-Pee-Chee Lary Sorensen, 1982 O-Pee-Chee Ron Hassey, 1982 O-Pee-Chee Andre Thornton, 1988 Topps John Farrell, 1988 Topps Ken Schrom, 1996 Topps Chad Ogea, 1996 Topps Herb Perry, 1989 Topps '88 Record Breaker (flaming balls himself) Doug Jones, 1999 Fleer Ultra Bartolo Colon, 1992 Fleer Ultra Thomas Howard, 2002 Topps Cliff Lee, 2002 Topps Joel Skinner, 1987 Topps Brook Jacoby, 1987 Topps Frank Wills, 1987 Topps Pat Tabler, 2005 Topps Aaron Boone, 2005 Topps David Riske, 1988 Topps Dave Clark. I am hoping that this weekend I will be able to starting checking these cards against my database. There are several in there I am pretty sure I need to complete some of the team sets. Thanks a TON, Spiff! Today, I present the 2nd installment of "TonT." In case you have forgotten the rules, here they are! Frank Thomas - White Sox - .5 points - TonT Total - 2.5 points - If this card had a caption, it would read: "Don't Mess With Me"
In a pack of five cards, I walked away with 2.5 points. The pack was a bust as far as Tribe cards go, but at least I avoided the traps! This is a short post today, but at least you get to see some more players who sported the Number 9 jersey for the Tribe. I'll post more this weekend! George Banks - 3 seasons (1964-66) - This George Banks should not be confused with the the "other" George Banks (wikipedia ref)! Banks wore Number 9 his first year with the Tribe then switched to #14. While wearing #9, he made 17 plate appearances, scoring 6 runs on 5 hits with a double, 2 home runs, and was walked SIX times and striking out six times... He ended his season with a career-high .294 average. 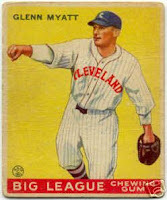 Glenn Myatt - 14 seasons (1923-1935) - The Indians didn't issue uniform numbers until 1931, remember. But once they did, Myatt was #9 all the way. He was born in Argenta, Arkansas, which I had never heard of. Good reason... It is now part of Little Rock, just down the road (okay about 100 or so miles down the road) from my house. He was a catcher, though in 1925, he played left field for one game. During his career as a Triber, Myatt had 638 hits on 2,317 at-bats and scored 319 runs. Not a big home run hitter (37 during his Indians days), he still managed to bring in 353 RBIs with 126 doubles and 33 triples. He only struck out 159 times while playing for Cleveland (that is only 7% of his at-bats!). He left the Indians batting a Tribe-career average of .252. Herman Reich - 1 game (1949) - Yes, you read that correctly. In 1949, he played for the Senators, the Indians, and the Cubs, and then left major league baseball for good. In his single game with the Tribe, he had two at-bats. He got a hit and a walk, netting him a .500 average. He was born in 1917 and according to baseball-almanac.com, he is still living! Jamie Quirk - 1 game (1984) - Hmmm, seems to be a pattern developing here. Quirk came from the White Sox, smacked the ball out of the park (the game-winner in fact) for the Tribe, then went to Kansas City. He had a 'perfect' 1.000 average for the Tribe. He is also the only player that I know of that played for the Tribe whose last name begins with a "Q." Jason Dubois - 1 season (2005) - Dubois made 45 trips to the plate for the Tribe. Of those, he struck out 25 times (that's over 55% - ouch). He did get 10 hits with 6 runs, two of which were homers. He left the Tribe with a .222 average. 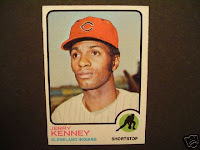 Jerry Kenney - 1 season (1973) - Kenney batted in only five games his final season in the majors. He came to the Indians from the Yankees and had 4 hits on 16 at-bats (2 RBIs and a triple). He did not strike out at all while wearing a Tribe uniform, which helped him leave baseball with a .250 season. Yesterday (Monday), Cabrera made a diving catch on a line drive by Lyle Overbay, touched second base and then tagged out Marco Scutaro to quickly end the fifth inning, giving him the 14th-ever unassisted triple play! Spiff had sent me a request to do a Rangers/Indians trade, and I was all for that! In fact, I have lots of cards from nearly every baseball team, so if anyone wants to trade me Indians for their favorite team, shoot me an email (davidinark (at) yahoo -dot- com). Once I had my Rangers in order, Spiff sent me a want list and I went through it as best I could, pulling as many cards from the years he wanted as I could find. I have no idea how many cards he ended up with 100 or more, maybe? A few days after I had his cards ready to ship out, I got a box from him with TONS of Tribe cards, including stickers and oddballs. There is a stack of 1988 Panini stickers, some 2005 Turkey Red, 1993 Ted Williams Series Larry Doby, 1990 Fleer Award Winners Greg Swindell, Upper Deck cards from several years, Donruss, Topps, 1992 Topps Gold Thome, a cool round Indians logo sticker, Score cards, T95 Old Judge, 2008 Topps including Cliff Lee from nearby Benton AR, Pronk cards, Upper Deck "Baseball Assistance Team (BAT)" Sam McDowell, and 1977 Pepsi disc Rico Carty. I'm looking forward to taking all my recent trade treasures and adding the ones I need to my database! Thanks to Spiff and all the folks I've done trades with recently! It has been some time since I've created a post regarding the countdown. I took one look at the FORTY-ONE players that have worn the Number 9, and it took me a bit to get rolling with it. But, without further delay, I bring to you Part 1 of the list of Tribers who have worn the Number 9. There are some greats in here (and to come) and some rather forgettables or unknowns, but that is what makes baseball great in the first place! Billy Sullivan, Jr - 2 seasons (1936-37) - Billy Jr wore #14 when he came to the Tribe from the Reds, and then switched to #9 his 2nd year before heading to the St. Louis Browns. In his 1st year with the Tribe, he had 112 hits on 319 at-bats for a .351 average. Since we are looking at his season wearing #9 right now, we can focus on this: 48 hits in 168 at-bats with 29 runs scored. He had 12 doubles, 3 triples, and 3 home runs with 22 RBIs. He only struck out 7 times that season, leaving the Indians with a .286 average that season. 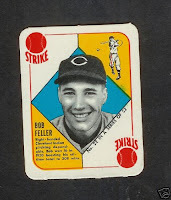 Bob Feller - 18 seasons (1936-1941, 1945-1956) - There is no doubt that Feller will show up as a top pick in this countdown. But, he only wore the #9 during his rookie season (He also sported #14 and #19). We will visit the HOF'er Feller later, but for his rookie year, he went 5-3 in pitching with a 3.34 ERA, only giving up one home run. He would, of course, go on to so much more. And, we'll take a look at his career in #14 and #19 later. Bob Garbark - 2 seasons (1934-35) - Garbark played only 11 games in an Indians uniform. In his rookie season, he scored a run without getting a hit (he one walk) at all, netting him a 1-run .000 average. The next season, he had 6 hits on 18 at-bats with 4 runs and 4 RBIs, netting him a .333 average. After that, he was sent to the Cubs after a year off from baseball. Bob Hale - 2 seasons (1960-61) - We first saw Hale last go 'round wearing #8. He only wore that number for half a season, then switched to Number 9. In his first year with the Tribe, he had 70 at-bats in 70 games. Now, if he 70 hits, that would have been something. He managed 21 hits with 2 runs and 12 RBIs. He scored a .300 average so the Tribe kept him around for another season. Unfortunately, his next season netted him just a .167 average with 6 hits on 36 at-bats. The Indians let him go part way through the '61 season. Brady Anderson - Part of 1 season (2002) - Anderson is best known for wearing Number 9, all right. But, for wearing it in an Orioles uniform, not a Tribe uniform. In fact, when I saw his name on the list, I was sure it was a different Brady Anderson. Turns out, Anderson played his final season in an Indians uniform. He batted in only 34 games, scoring 4 runs on 13 hits in 80 games. His .163 average was enough to effectively end his ML career for good. 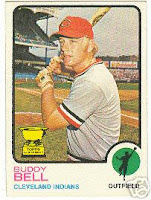 Buddy Bell - 7 seasons (1972-1978) - The Indians all-star, fan favorite and fellow Pittsburgh-raised player only wore #9 during his rookie year. He had 199 hits in 466 at-bats, scoring 49 runs with 21 doubles, one triple, and 9 home runs. He brought in 36 RBIs while getting walked 34 times and striking out 29 times. His .255 rookie-year average turned out to be his LOWEST as a Triber (things will only go up for him!). We'll see him again wearing uniform #25. Butch Benton - 1 season (1985) - Benton played in 31 games for the Tribe. He only had 12 hits in 67 at-bats, but scored 5 runs on those 12 hits. Plus, he brought in 7 RBIs. Unfortunately, he ended his major league career with a .179 seasonal average for the Indians. Cal Dorsett - 3 seasons (1940-41, 1947) - "Preacher" Dorsett changed uniform numbers ever season, only wearing Number 9 during his last season. He pitched in 2 games during that season and managed to snag a whopping 27.01 ERA (4 ER, 4 R, and 1 HR) in just 1.1 innings! Ouch... We'll see how his other years fared as we look at the other numbers he wore during his ML career. Chris Turner - 1 season (1999) - Turner, yet another very short-termer, only played in 12 games for the Indians. He got 4 hits on 21 at-bats. His 8 strike outs helped him leave the Tribe with a .190 average. Duke Sims - 7 seasons (1964-1970) - Despite wearing Number 8 and netting a .000 average his rookie season, Sims proved to be a homer-run ready catcher for the Tribe. Between 1967 and 1970, he hit no fewer than 11 homers per season, with '69 and '70 producing 18 and 23 respectively. It would be about ten years after Sims left the Tribe before I would even have a clue who he was (since that was about when I started really collecting), and he became one of my favorite "old time" players (funny what a 10 year-old's perspective is). Overall, Sims played in 536 games as a Triber with 369 hits on 1561 at-bats. He had 51 doubles and only 4 triples, but hit 76 home runs with 216 RBIs (he had 4 37+ RBI seasons). Not including his rookie season, he left the Tribe with a .232 Indians-career average. Eddie Phillips - 1 season (1935) - There have been at least THREE players with the name "Eddie Phillips" (not to mention a boxer as well) and getting the stats for the one that played with the Tribe took some effort... LOL! This Eddie Phillips wore both #9 and #15 in his one season with the Tribe, which turned out to be his final season in the majors. He came to the plate 220 times and hit 60 times with 18 runs, 41 RBIs, 16 doubles, one triple, and one home run. He ended his final season in "the Bigs" with a .273 average.